All astronomers at DTM have access to Carnegie's Las Campanas Observatory, including the twin 6.5 m Magellan Telescopes, the 100-inch du Pont Telescope, and the 40-inch Swope Telescope. Carnegie is also a member of the Sloan Digital Sky Survey consortium and is hosting the APOGEE-2 spectrograph at the du Pont telescope. Las Campanas is one of the premier sites in the world for astronomy because of its excellent seeing and clear skies. The observatory deploys a broad range of visible and near-infrared imagers and spectrographs as well as a high-contrast adaptive optics deformable secondary and a wide-field secondary. Details on the Observatory and instrumentation, can be found at http://www.lco.cl/ and http://obs.carnegiescience.edu/astronomers. Carnegie has an internal time allocation process that occurs once per year for the small telescopes and twice per year for Magellan. The call for proposals may be found at http://proposals.obs.carnegiescience.edu/. We have built a specialized astrometric camera, the Carnegie Astrometric Planet Search (CAPS) camera, with support from the NSF and CIW. 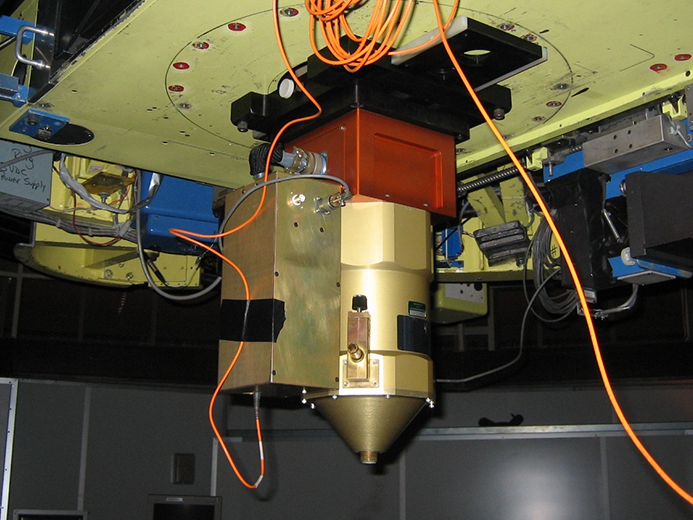 The heart of the CAPS camera is a Teledyne Hawaii-2RG HyViSI array, with the camera's design being optimized for high accuracy astrometry of red dwarf stars. The 2048 x 2048 HAWAII-2RG array is the state of-the-art multiplexer for advanced astronomy and space telescope applications. The ''Guide Mode'' provides a programmable window which may be read out continuously at up to 5MHz pixel rate for stable tracking of guide stars. The readout is designed to allow interleaved readout of the guide window and the full frame science data. The Hawaii-2RG HyViSI array thus allows relatively bright target stars to be read out at a much higher cadence than the relatively faint reference stars. More details about CAPSCam may be found at www.lco.cl/telescopes-information/irenee-du-pont/instruments/website/capscam. 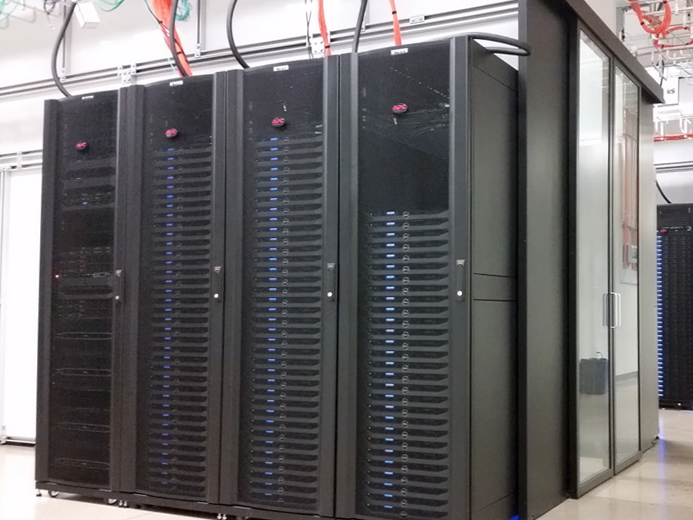 DTM has access to the memex high performance computing cluster physically located on the Stanford University campus, which consists of 107 servers with 2,568 cores in 214 CPUs. The cluster has 13,696 Gigabytes of memory, 108 Teraflops of theoretical CPU performance, and 5.82 Teraflops of theoretical GPU performance. The nodes are connected to a Lustre-based storage system with more than 1 Petabyte raw storage capacity. All connectivity between nodes and between the cluster and the storage device is handled by a lightning fast non-blocking FDR InfiniBand (Fourteen Data Rate Infiniband, 54.54 Gbit/s bandwidth for 4X aggregate links) network. DTM maintains a large pool of broadband seismic instrumentation, including 25 Streckheisen STS-2 sensors, 12 Nanometrics Trillium Compact sensors, 26 RefTek RT130-01 24-bit digitizer/datalogger systems, and 12 Nanometrics Centaur digitizer/dataloggers (6 6-channel/6 3-channel). Unique to this instrumentation is the DTM-designed and built quick deploy box (left) that contains all the equipment needed to install a single seismic station in a 35 pound box suitable for checked luggage (pictured below). DTM also owns a newly purchased Scintrex CG-6 Autograv gravity meter (right). The geochemistry group of the Carnegie Institution of Washington's Department of Terrestrial Magnetism (DTM) maintains six mass spectrometers for the analysis of trace elements and isotope ratios at high sensitivity, high precision, and/or high spatial resolution. In addition, the group shares four electron beam instruments for the characterization of sample surfaces and elemental compositions, as well as for focused ion beam lift out for additional characterization such as transmission electron microscopy. The equipment is available to any member of DTM, subject to agreement of the responsible member of staff and the appropriate training. A Nu Plasma HR, installed in 2009, is a multicollector (12 Faraday cups and 4 multipliers) used for isotopic measurements of B, Si, Fe, Ag, Sr, Nd, Hf, Pb as well as isotope dilution concentration measurements of Rb, Sr, Pd, Sm, Nd, Lu, Hf, PGE, Re, U, Pb, and Th. For more information, please contact Tim Mock. A Nu Plasma II multicollector instrument under the direction of Geophysical Laboratory Staff Scientist Anat Shahar is also installed in our main mass spec lab for shared use; it essentially duplicates and extends the capabilities of the Nu Plasma HR. For more information, please contact Tim Mock. A ThermoFisher iCap-Qc RF quadrupole instrument is capable of high sensitivity and rapid scanning of the entire periodic table. It is used for simple elemental concentration work on unknowns, diagnostic work supporting the chemistry lab and tests for sensitivity for laser ablation analysis, full trace element analyses on minerals, glasses and whole-rocks both by solution and laser ablation. With the laser, it has been used for laser ablation U-Pb dating of zircons, and for trace element measurements of volcanic glasses and mantle minerals (e.g., olivine, pyroxene, garnet). When attached to the laser along with the Nu Plasma HR, partitioning of the laser ablated material from zircons between the two instruments can allow simultaneous U-Pb analysis on the iCap and high-precision Hf isotope analysis on the Nu Plasma. For more information, please contact Tim Mock. 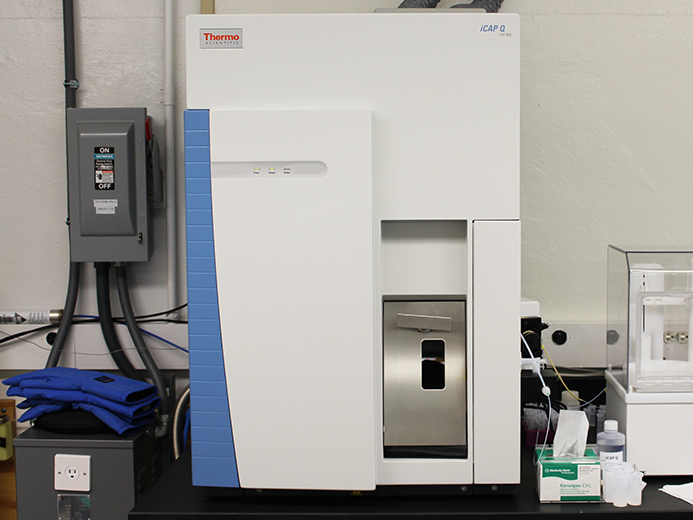 DTM currently operates two thermal ionization mass spectrometers, one a 2004 vintage Thermo Triton and the second a 2019 vintage Triton XT. Both instruments have nine moveable Faraday cup collectors, a single ion multiplier and the option of many low-noise faraday amplifiers. Both Tritons have state of the art sensitivity and accuracy and are used in positive mode (P-TIMS) for isotopic analysis of Cr, Sr, Nd, Ba, Sm and Pb. In negative mode (N-TIMS) the instruments are used primarily for W and Os isotope analysis. 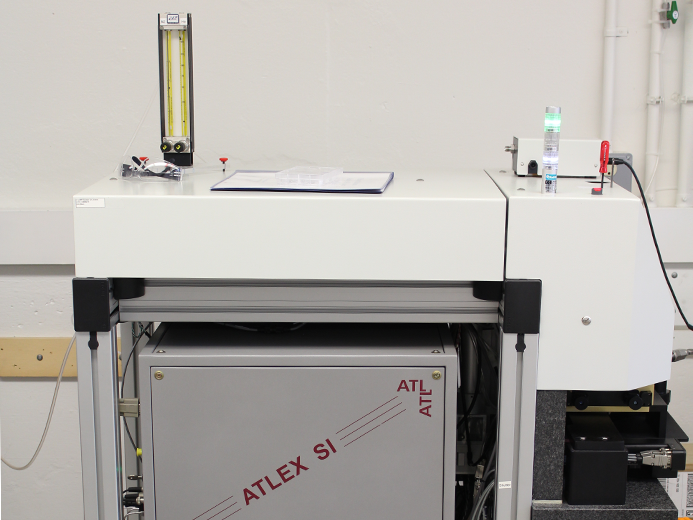 Both instruments are capable of isotope ratio measurement precisions as precise as ± 3 parts per million. For more information, please contact Tim Mock. Laser ablation for our ICP-MS instruments is accomplished with a 193 nm Excimer laser (Analyte 193.H) made by Photon Machines Inc. Software communication between the laser and iCap computers allows for programmed automated analyses. A Cameca ims-6F ion microprobe, installed in 1996, can be used for in situ measurements of isotopes and trace elements with spatial resolution down to about one micron. It is a single-collector instrument (Faraday cup or electron multiplier) equipped with oxygen and cesium primary ion sources and an electron flood gun for charge compensation. Measurements can be fully automated. A newly-installed (2017) RF plasma O source ("Hyperion" - Oregon Physics LLC) allows a factor of 5 improvement in O- beam diameter compared to the standard duoplasmatron source, matching the resolution of the Cs+ beam. For more information, please contact Jianhua Wang. A Cameca NanoSIMS 50L ion probe was installed in 2006. Like the ims-6f it is equipped with Cs+ and O- ion sources, including a high-resolution Hyperion source, and a charge-neutralization electron gun and can be used for fully automated measurements. However, unlike the ims-6f it is a multicollector instrument with one fixed and six moveable detectors (either Faraday cups or electron multipliers) and has both higher transmission and better spatial resolution for a given beam current (down to <100 nanometers). For more information, please contact Jianhua Wang. A JEOL JXA-8530F field emission electron microprobe analyzer (EMPA) was installed in 2015. Conventional EMPA analyses (e.g., quantitative analysis of major, minor and trace elements), cathodoluminescence (CL) spectroscopy and X-ray mapping can be carried out on this instrument. It is equipped with five dual-crystal wavelength dispersive spectrometers, two 30mm2 energy dispersive silicon drift detectors (JEOL and Thermo-Noran) and a JEOL xCLent cathodoluminescence system. The instrument is also equipped with a cold trap and an in-situ plasma cleaner for minimizing sample contamination during carbon analysis. The instrument can be operated at up to 30 kV and beam currents of up to 1 µA. It has a practical spatial resolution of 5 nm for imaging and 1 µm for quantitative analysis. The electron probe is equipped with state-of-the-art software (JEOL, Probe for EPMA and xCLent Image) for combining and manipulating elemental and CL maps. To schedule time on the electron probe, please contact Emma Bullock. 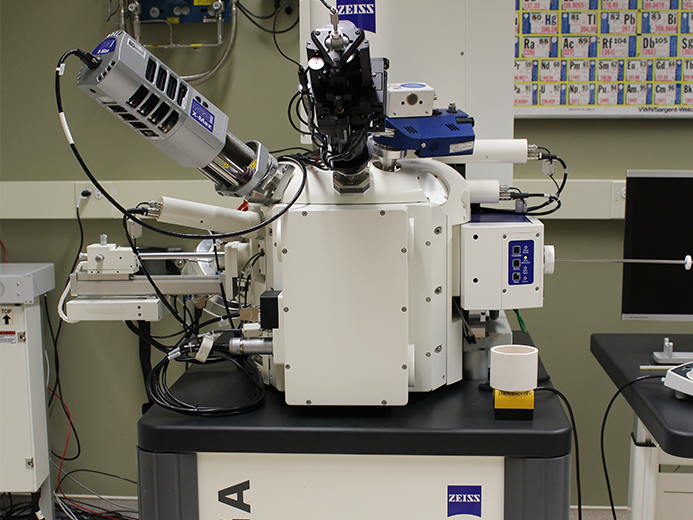 Our Zeiss Auriga field emission SEM was installed in 2009. It is equipped with in-chamber secondary electron (SE) and backscattered electron (BSE) detectors, a retractable concentric BSE detector, and a retractable STEM detector for imaging electron transparent materials. 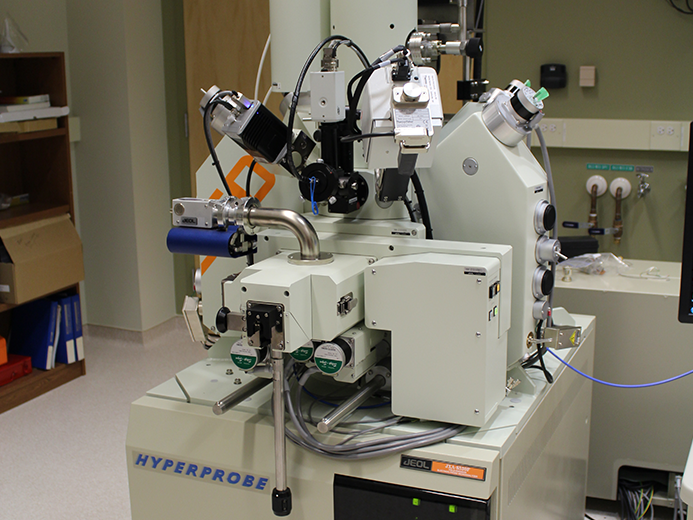 In addition, it is equipped with an Oxford Instruments X-Max 80 (SDD) EDS system and NordlysNano EBSD camera. Other features include local charge compensation (for non-conductive samples), large area mapping/imaging software, an Omniprobe micromanipulator, and an Evactron plasma cleaner. To schedule time on the SEM, please contact either Suzy Vitale or Emma Bullock. 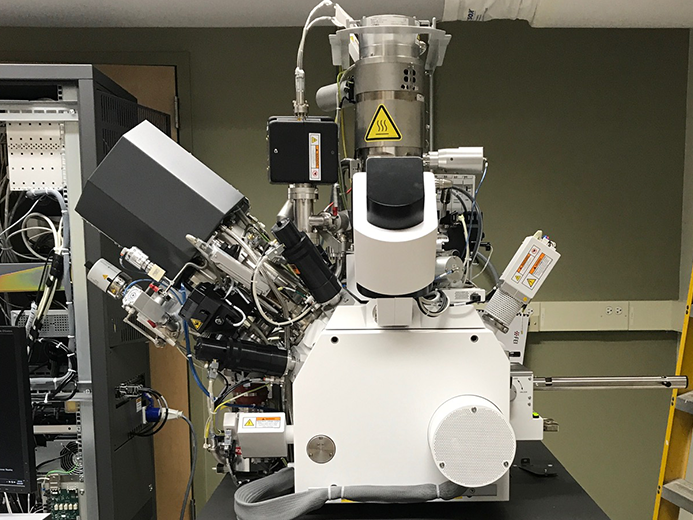 Installed in late 2017, our newest addition to the microscopy facility is the FEI Helios PFIB G4, a dual beam Xe+ plasma FIB/SEM. This state-of-the-art instrument is used for nano-to-milli-scale milling, patterning, 3D imaging, and TEM sample preparation of materials. It is equipped with a full suite of electron detectors for electron and ion imaging: in-chamber secondary electron (SE), backscattered electron (BSE), and secondary ion (SI) detectors, an in-column BSE detector, a retractable concentric BSE detector, and a STEM detector for imaging electron transparent materials. This instrument can prepare a TEM lamella from the bulk and go straight to STEM imaging without breaking vacuum to accommodate air sensitive materials. It is also equipped with a cryo stage to accommodate beam sensitive (biological) materials. As with most FIB/SEMs, the Helios has a micromanipulator, a gas injection system (Pt and Dx diamond etch), and a plasma cleaner. In addition, the Helios has special automation software that makes TEM sample preparation and 3D imaging easier for the non-expert user. To schedule time on the FIB, please contact Suzy Vitale. A JEOL 6500F field-emission scanning electron microscope (SEM) was purchased in 2002. It is equipped with secondary and backscatter electron detectors (for imaging with better than 5 nm spatial resolution), Oxford Instruments energy dispersive spectroscopy (EDS) and electron backscatter electron diffraction (EBSD) systems, a fully automated 5-axis stage and an in situ micromanipulator (Kleindiek). The EDS detector is an 80 mm2 silicon drift detector. For more information, please contact Larry Nittler. These include binocular, metallurgical and petrographic optical microscopes equipped with digital cameras, a Narishige micromanipulator, a plasma asher, a Leica ultramicrotome, and a New Wave MicroMill sampling drill. 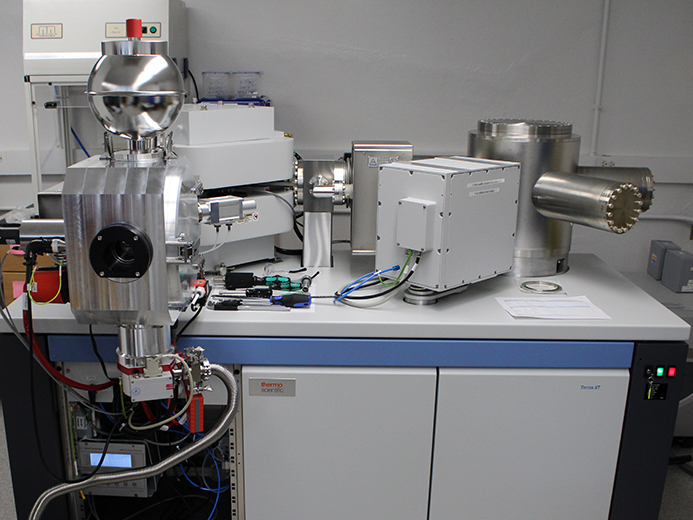 The MicroMill can extract mineral grains from thin or thick sections and when coupled with the laser system from the ICP-MS lab (above) and the SIMS instruments (above), offers great flexibility when analyzing small samples either in-situ or by removal. The DTM geochemistry laboratories include over 4,000 square feet of clean laboratory space separated into 14 rooms. For access, please see Mary Horan. Also included is a rock crushing/sawing room and mineral separation facilities (stereomicroscopes, magnetic separators, and heavy liquids). For access, please contact Tim Mock. The Department has well-equipped and well-staffed machine and electronics shops for the development and construction of new components for the instruments and apparatus for the labs.